On December 20, the Tejas light combat aircraft (LCA) was cleared to enter operational service with the Indian Air Force (IAF). Now Hindustan Aeronautics Ltd (HAL) faces the daunting transition from handcrafting Tejas prototypes into factory-assembling the 200-fighter Tejas fleet that Defence Minister AK Antony has envisioned. The ministry of defence (MoD) has sanctioned Rs 1,556 crore for HAL’s high tech production line that aims to build 12 Tejas fighters each year. The funds will come from the IAF (25 per cent); the navy (25 per cent), while HAL will put up half the money. 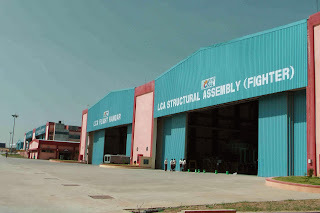 Business Standard visited the new Tejas production line, an expansive 28,000 square metre facility in four massive hangars in HAL, Bangalore. 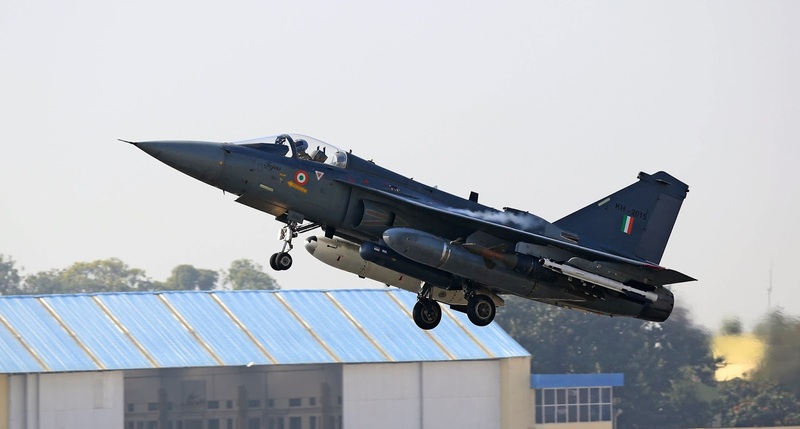 Work is already underway on the first IAF order of 20 Tejas Mark I fighters, with an order for 20 more in the pipeline once the aircraft gets “final operational clearance” next year. The first two fighters being “series produced” --- they are numbered SP-1 and SP-2 --- are visibly taking shape. “By end-March 2014, SP-1 will fly, and SP-2 will fly a few months later. By the end of next year four Tejas will be in production. In 2015-16, we will build six fighters, and in 2016-17, we will build nine. We are targeting an annual capacity of 12 Tejas fighters,” says V Sridharan, the project manager hand-chosen to build the LCA. Earlier, he set up HAL’s production line for the Hawk trainer. Over the years, excellent designs like the Arjun tank have failed the transition from design into product. This is because India’s archaic defence production policies make the Defence R&D Organisation (DRDO) responsible for designing equipment, with production responsibility then passing onto a network of 8 defence public sector undertakings (DPSUs) and 39 ordnance factories (OFs) with long reputations for sloppy production. Having played little role in design, the manufacturing agencies struggle to produce the system. The Tejas could be a game-changer. Firstly, HAL has played a major role both in designing the Tejas and in building prototypes for the flight-test programme. Secondly, HAL has brought a radically new approach to Tejas production, adopting global aerospace manufacturing standards and an unprecedented approach to quality control. Walking around the Tejas assembly line, Sridharan explains that the sixteen Tejas prototypes HAL has built are each different from the other. As the Aeronautical Development Agency (ADA) incrementally refined and improved the fighter, each new prototype incorporated improvements and additions. The most recent prototype has a pressure refuelling system that lets the Tejas be topped up Formula One style, in just 8 minutes and then flown back into combat. “As a result of all these changes, a panel from one Tejas would not fit another. 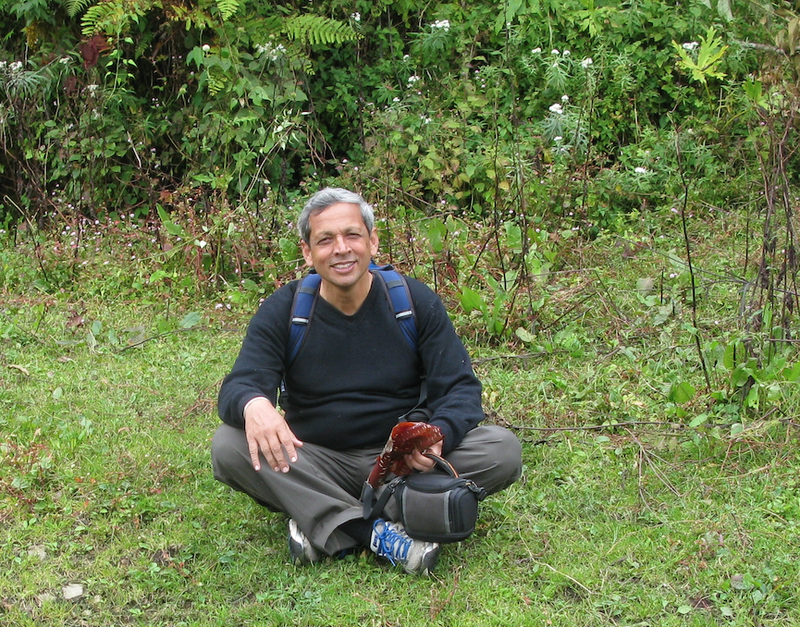 Now we will implement absolute standardisation, with identical components, assemblies and panels,” explains Sridharan. This is being done with laser scanners that ensure that a number of key points (called “locators”) on each aircraft being built is exactly where it should be. By measuring with the laser, it is ensured that the locator is within 80 microns, i.e. about one-tenth of a millimetre, of where it should be. These are international standards, used by companies like Boeing. It is evident from the focus of the laser trackers teams that it is painstaking work. This standardisation, and coordinating the flow of Tejas systems and sub-systems to the assembly line constitutes what Sridharan describes as the process of “stabilising” the Tejas line. “Once the process is stabilised, we can transition to higher rates of production. My initial focus will be on production quality; then we will scale up production. HAL will meet the target of building 20 fighters by 2016-17,” he says. That was the pattern while building the Hawk. After building just two aircraft in the first year, seven were built in the second year. In the third year, HAL built 18 Hawks, and the remaining 14 Hawks were produced within months. Within ADA and in HAL, there is expectation that better production could improve aircraft performance. “Better build quality could well improve the Tejas’ aerodynamic performance, reducing drag, and improving its speed, rate of climb and turn rate,” says a designer. HAL’s chairman, RK Tyagi, explains that the international best practices being introduced in the Tejas assembly line will be replicated across all the aerospace giant’s production lines, including the Sukhoi-30MKI line in Nashik and the Hawk trainer line in Bangalore. “We have earmarked Rs 3,500 crore of HAL funds for making our production lines world class. Our focus is to gain the IAF’s confidence. We will do what is necessary for that,” says Tyagi. On December 20, the Tejas light combat aircraft (LCA) obtained Initial Operational Clearance (IOC), entering the Indian Air Force (IAF) fleet where regular air force pilots will fly it. After 28 years of development, the Tejas is on course to obtain its Final Operational Clearance (FOC) by end-2014, clearing it for full combat. Hindustan Aeronautics Ltd (HAL) is building forty Tejas fighters for two IAF squadrons. Questions are rightly raised about what combat role the Tejas could play, given that its specifications were framed decades ago. Sceptics argue that a fighter so light, with such a short operating range, would have little role in an aerial battlefield where bigger, heavily armed fighters call the shots. An evaluation of the Tejas’ combat capability must consider its flying performance, its avionics and the weapon load it carries. At IOC, it already flies at Mach 1.6 (2,000 kmph); operates up to 15,000 metres (50,000 feet); and carries 3,500 kg of mission payload, including weapons and sensors. Its combat radius is 300-350 km, which would be extended next year through in-flight refuelling. By FOC next year, this performance would be enhanced. The Tejas has been designed as a multi-role fighter. It can engage enemy aircraft with the R-73 short-range air-to-air missile (SRAAM); by FOC next year, more potent air-to-air missiles, probably the Israeli Derby and Python, would be integrated. Against ground targets, the Tejas carries conventional and laser-guided bombs. Next year, it will have an integral 23 millimetre Gasha cannon. The Tejas’ avionics --- radar, laser and inertial navigation system --- enhances the accuracy of these weapons. Its highly rated Elta EL/M-2032 multi-mode radar provides multi-role capability, allowing the pilot to fire air-to-air missiles at enemy aircraft; and also bomb ground targets with a highly accurate navigation-attack system. The pilot operates his weapons through a head-up display (HUD), or through a helmet-mounted sighting system (HMSS) by merely looking at a target. Experienced fighter pilots say the Tejas is the IAF’s most “pilot friendly” fighter. Although it is one of the world’s lightest fighters, the Tejas’ weapons load of 3,500 kg compares well with most IAF fighters, including the Mirage-2000, Jaguar, upgraded MiG-27 and the MiG-21. Depending on the mission --- strike, photoreconnaissance, or air defence --- its eight hard points can carry missiles, bombs, fuel drop tanks or a targeting pod. It can bomb targets and fire missiles as accurately as the Sukhoi-30MKI. The latter scores mainly in its longer range and bigger weapons load, both stemming from its much larger size. The Tejas’ capability is best known to the air force and navy test pilots in the National Flight Test Centre, who have tested it in 2,400 flights. They claim it may be more versatile than the MiG-29 (primarily built for air-to-air combat); the MiG-27 and the Jaguar (both oriented to ground strike); and all variants of the MiG-21, including the multi-role BISON. The Tejas’ likely adversary, the Pakistan Air Force’s F-16 fighter, has a slightly larger flight envelope, but the Tejas’ superior avionics give it a combat edge over the PAF’s older F-16A/Bs (currently being upgraded in Turkey); and superior to their new JF-17 Thunder light fighter, co-developed with China. Only the PAF’s 18 new F-16C/D Block 52 fighters, flying since 2010-11 from Jacobabad, may be a match for the Tejas. The IAF’s operational plans earlier had strike aircraft like Jaguars or MiG-27s attacking ground targets, while air defence fighters like the MiG-29 covered them from enemy aircraft. Now mission-specific aircraft are giving way to multi-role fighters, which can do both jobs. This doctrinal shift stemmed from the Mirage-2000, the IAF’s first multi-role fighter, which was inducted in the mid-1980s. The Mirage-2000 inspired the Tejas in both role and design. Today, the IAF controls the aerial battle from airborne early warning and command (AEW&C) aircraft like the Phalcon, a giant radar mounted on a transport aircraft. Flying over the battle space and scanning 400 kilometres on all sides, the AEW&C identifies enemy aircraft and, over a secure datalink, allocates fighters from nearby bases to tackle the intruders. The AEW&C also orders up fighters to strike ground targets in the land battle. “Tejas light fighters, located at forward airbases like Pathankot, Ambala, Sirsa or Jodhpur are ideal for missions in the vicinity of the border. They are close at hand and react quickly. Being far cheaper, they can be bought and used in larger numbers, saturating the enemy’s radar picture and complicating his decision-making,” says a senior former IAF planner. Employing the Tejas for the tactical battle would allow the IAF’s heavy, multi-role fighters like the Su-30MKI and Rafale to be focused on targets deep inside enemy territory, which are beyond the range of the Tejas --- such as major air bases, military headquarters and strategic infrastructure. These fighters, which carry far more fuel and weapons, can take off from bases deep inside India, bomb targets deep inside enemy territory, and also shoot down enemy fighters. Yet, heavy fighters have their downsides. Maintenance is complex, with half the Su-30MKI fleet usually unavailable for operations. Enemy radar picks up the heavy fighters more easily; the Tejas is smaller, and also stealthier, being largely fabricated from composite materials. Moreover, the loss of a Sukhoi-30 is a Rs 400 crore blow; a Tejas will probably costs one-third of that. Many IAF planners advocate a balanced air force, with a mix of light and heavy fighters. Light fighters like the Tejas would respond to the tactical battle, while heavier fighters, with their longer range and greater strike power, could tackle more strategic targets. The light fighter has a long tradition in the IAF. On December 17, Defence Minister AK Antony told parliament that 254 MiG-21s --- or 12 squadrons worth --- still remain in service. The Tejas provides an effective replacement for those obsolescent machines. HAL’s new assembly line in HAL Bangalore plans to build 8 Tejas Mark I fighters annually, stepping up capacity to 16 fighters per year. 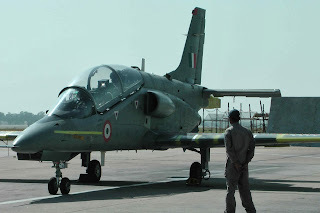 If the IAF absorbs HAL’s entire production capacity, it would have 3-4 squadrons of Mark I fighters; after which the Mark II would start rolling off the line. Creating 12 Tejas squadrons to replace the MiG-21 would retain a balanced air force, and also galvanise the aerospace production eco-system needed for developing the IAF’s future fighters. THANK YOU FOR VISITING. HAVE A VERY MERRY CHRISTMAS AND A HAPPY NEW YEAR. In contrast to the gloomy prognostications on India’s economy and its place in the world, the year that is ending offers a happier picture in politics and national defence. The meteoric rise of the Aam Aadmi Party holds the tantalising promise of aspiration-based politics and an embrace of rights and duties by the citizenry. National defence too offers scope for optimism. 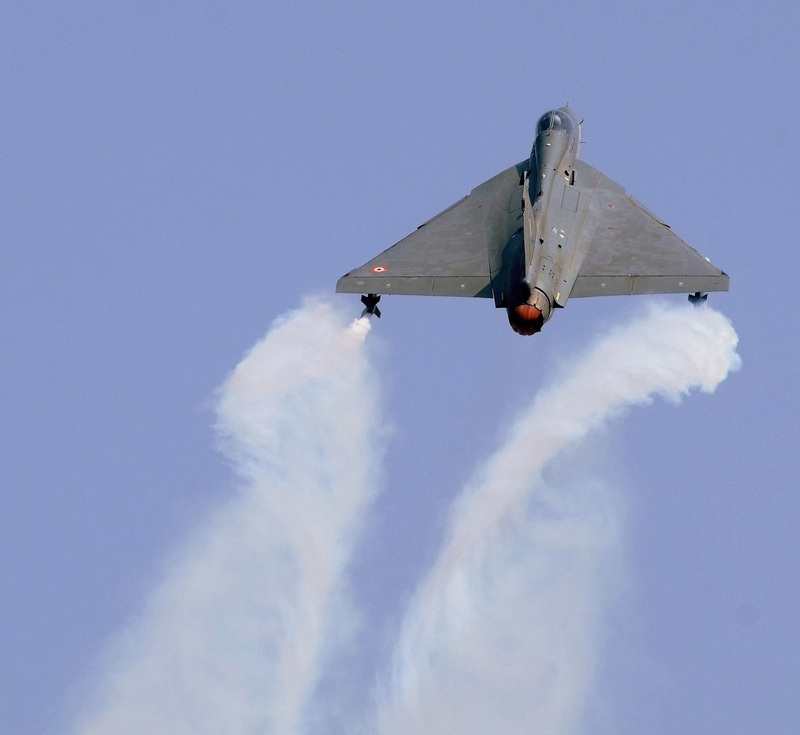 Emblemising the promise of more indigenous weapons and equipment was last week’s induction of the Tejas light combat aircraft (LCA) into the air force after almost three decades on the anvil. While the Tejas remains a work in progress, the air force could well be more enthusiastic about speeding up development and ordering larger numbers for its combat fleet. A second aerospace success is within touching distance, with the Sitara intermediate jet trainer nearing the milestone of air force acceptance. An advanced medium combat aircraft (AMCA) is taking tentative shape, building on the design skills and technologies that accrued while developing the Tejas. Also holding promise is the Indo-Russian partnership to design a fifth generation fighter aircraft (FGFA), with negotiations advanced on a $12 billion R&D contract that will frame the joint effort. So far, the Defence R&D Organisation (DRDO) and Hindustan Aeronautics Ltd (HAL) have waged lonely struggles to reinvent the wheel. With their basics in place, these agencies are in place to absorb the next level of design and manufacturing skills alongside Russia. With the Tejas programme having taught them the intricacies of building a light fighter, and with the FGFA programme now extending those skills to heavier aircraft, the indigenous AMCA programme is poised to benefit. Encouragingly, the air force and the ministry of defence (MoD) are eager to support this effort. On-going structural changes also warrant optimism. Aerospace experts have long clamoured for an overarching body to coordinate the development of national aerospace design and manufacturing expertise. The government has now accepted that logic, even if belatedly. Separately, the on-going rejuvenation of HAL by a dynamic new chairman and the aggressive entry of private sector companies like Reliance Industries hold out the promise of a competitive market environment replacing the tired old sarkari ways of doing business. Even greater promise lies in naval shipbuilding. While the commissioning in Russia last month of the 44,500-tonne aircraft carrier, INS Vikramaditya, grabbed the headlines, the more significant development was the launch of the indigenous aircraft carrier, INS Vikrant, at Cochin Shipyard in August. The 40,000-tonne Vikrant would join the naval fleet only in 2018, but this success positions India to build all its future aircraft carriers. The Vikrant’s successor is likely to be a bigger 65,000-tonne aircraft carrier, which would start construction well before the Vikrant is completed. This means India can build the entire range of surface warships, even though submarines remain a worrying capability gap. In June, Russia handed over INS Trikand, the last in a series of six stealthy frigates that the navy imported over the last ten years. Today, all 45 warships being built for the navy are taking shape in Indian shipyards. Another giant stride in indigenisation occurred in August when a miniature nuclear reactor powered up INS Arihant, the nuclear-propelled, nuclear missile-carrying submarine built by the DRDO alongside private companies, especially L&T. This crucial underwater component of the country’s nuclear deterrent will be followed by several larger and more capable successors. The navy, more enthusiastic about indigenisation than the army and air force, is emerging as a significant aircraft operator. In May, a squadron of Russia-built MiG-29K fighters was commissioned to operate off the INS Vikramaditya (which, at the time of going to press, had sailed past Malta on its way to India). This year, Boeing delivered the first two of eight immensely capable P8I multi-mission maritime aircraft. The navy also inducted several indigenous aircraft --- operationalizing its first squadron of Dhruv light helicopters, and inducting its first Hawk advanced jet trainer, both in November. The admirals have committed fully to the naval Tejas fighter, which will operate alongside the MiG-29 from the Vikrant and its successors. As a step towards Blue Water capability, the navy had its own GSAT-7 satellite launched, allowing direct communication with warships anywhere in the Indian Ocean. The army remained a laggard in both indigenisation and procurement; with little little movement on the acquisition of badly needed artillery guns and anti-tank missiles. These delays could be transformed into an advantage, since indigenous capabilities have grown since these procurements were initiated. At least three entities --- DRDO, the Ordnance Factory Board and a slew of private companies are eager to develop artillery for the army, even if ultra-light howitzers needed for mountain divisions remain a daunting technological challenge. Meanwhile, the procurement landscape for anti-tank missiles has been transformed by the unprecedented US offer to co-manufacture the highly rated Javelin missile in India and co-develop an advanced version of it for the future. It remains to be seen if the MoD embraces these opportunities. Endemic delays and corruption allegations plague major foreign procurements. The contract to buy Rafale fighters is stuck in the MoD’s throat, too big to swallow and too big to spit out. The purchase of VVIP helicopters is mired in allegations of wrongdoing. Realisation is growing within South Block that indigenous development offers an alternative to these quagmires. The Defence Procurement Policy of 2013 explicitly recognised this. Will 2014 see the MoD take bolder steps towards self-reliance? Visitors' expertise forum: Where does the Tejas stand? I am planning a piece that evaluates the Tejas as a fighter and looks at what operational role it could play for the Indian Air Force. Views are solicited from visitors with strong experience in design and operations. As always, a gold star for the best response, and a silver star for the most inventive one. As Defence Minister AK Antony watched from a shamiyana overlooking the Bengaluru runway, two Tejas light combat aircraft (LCAs) came screaming down the runway, bombs and missiles fitted under wings, lifting effortlessly into the sky. As the fighters quickly faded into specks and then out of sight, hundreds of spectators watched two giant projector screens that played out video being transmitted live from the pilots’ cockpits. As the pilots positioned for their air-to-ground attack mission, the commentator revealed their target --- the spectators’ shamiyana. The screen showed the view from the pilot’s head-up display (HuD) as he locked his navigation-attack system onto the target. Even as both fighters simulated a successful bomb release, a third Tejas closed in behind them. This was a friendly fighter on an air-to-air mission, tasked to shoot down the intruders. The projector screens switched to the pilot’s helmet mounted display system (HMDS), which allows him to aim his weapons merely by looking at the target. In seconds, the intruders were in the “no-escape zone” of his R-73 air-to-air missiles. Mission accomplished! Also accomplishing a mission today were hundreds of technicians, engineers and scientists, who cheered wildly from the spectator stands as the three Tejas turned in for their final approach and landed smoothly, their arrestor parachutes streaming out behind them. 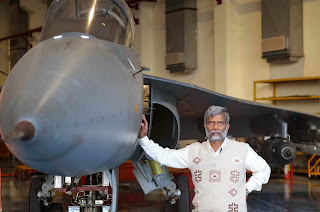 Twenty-eight years of toil, heartbreak and eventual success had culminated this day, when the Tejas LCA obtained its initial operational certificate (IOC), entitling it to be a part of the IAF fighter fleet. “As an Indian I feel proud to stand here on the occasion of the IOC of Tejas,” said Dr RK Tyagi, the chairman of Hindustan Aeronautics Ltd (HAL), who has been one of the hard-drivers behind Tejas flight-testing through this year, which saw a record-breaking 500 test-flights conducted. The programme to build a LCA began in 1985, although serious funding started only in Jan 1993. So far, about Rs 7,000 crore have been spent on the IAF version, which obtained its IOC today. Development continues separately of a naval version, which will fly from the navy’s aircraft carriers. The Tejas, as the LCA was named, is a light fighter, a category that broadly includes fighters under 14 tonnes in weight. It was planned to replace the IAF’s fleet of MiG-21, which is gradually being retired. The MiG-21 FL, a variant that was the IAF’s first supersonic fighter, retired from service on December 11. Other variants continue in service, but are unlikely to fly beyond 2017-18. While the IAF was initially reluctant to introduce the Tejas into operational service in large numbers, it eventually ordered two squadrons (40 fighters) of the Tejas Mark I. HAL will manufacture these on a high-tech new production line in Bangalore. The HAL chief stated today that the initial production target of 8 fighters per year would soon be ramped up to 16 aircraft annually. The IAF has additionally committed to ordering another four squadrons of the LCA Mark II, a more powerful, capable, version of the current Mark I fighter. The Tejas Mark I’s General Electric F-404IN engine would be replaced by a F-414 engine; and the mission avionics and weapons would be significantly upgraded. In addition to the six squadrons (108-120 fighters) committed by the IAF, the navy is expected to induct 40-50 fighters. Mr Antony stated today that about 200 Tejas would eventually be inducted. The immediate objective for the Aeronautical Development Agency (ADA), The Defence R&D Organisation (DRDO) setup that is developing the Tejas, is to obtain Final Operational Clearance (FOC), which would signify that the fighter is fully kitted and cleared for combat. Mr Antony has set a target of December 31, 2014 for FOC. Q. How good is the Tejas, which now has an initial operational clearance? As a technologist I would say that many improvements have been made in the last three years. 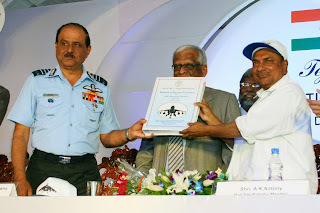 We have successfully addressed all the apprehensions the Indian Air Force (IAF) had. Today there are no serious technology challenges ahead. This year, we have test-flown the Tejas from IAF bases like Jaisalmer, Uttarlai, Jamnagar and Gwalior. In all these places, we operated the aircraft ourselves, while the IAF watched. We demonstrated that we could turn around the same aircraft after a gap of an hour or so. On occasions, one Tejas did three sorties a day. The IAF technicians and maintenance officers eventually told us that they now see an aircraft that is reliable enough for combat operations. Q. Is the Tejas Mark I ready for war? From the standpoint of operational preparedness, Initial Operational Clearance provides the capability of firing missiles, dropping laser guided bombs, conventional bombs and practice bombs. These weapons have been fired with sensors --- inertial navigation systems, and radar and laser systems. That show the Tejas performs well as an integrated weapons platform. Q. But there are many weapons systems that are still not fitted? All that is pending is the integration of the “beyond visual range”, or BVR, missile. We are obtaining a BVR missile from Israel for integration and demonstration. Inflight refuelling capability, and the integration of a BVR missile and a gun are capabilities that will be achieved before the Tejas gets Final Operation Clearance. The IOC clearance, according to conventions world wide, are this --- conventional and guided bombs and close combat missiles. Q. Given the long time that IOC has taken, what would you say is a realistic date for getting FOC? I’m targeting FOC for end-2014. This is realistic because the design processes are not starting now. The inflight refuelling system was ordered a year ago. Design and development for this has been on-going and some of the work is already half completed. So I am confident. Q Is the Tejas going to be a hangar queen” or is it easy to maintain? I’m glad that the IAF has pushed us to ensure that this aircraft is maintenance friendly. We have had IAF technicians and officers on the shop floor with us when we prepare the aircraft for sorties. They watch for difficulties in maintenance. Based on their suggestions, which they convey to us through “Requests for Action”, we have carried out some 200 design corrections to make the Tejas more maintenance friendly. We are trying to reduce the “maintenance man-hours per flight-hour”. This exercise has been done over the last three years and the IAF now believes that Tejas is maintenance friendly. Notwithstanding that, Maintenance Evaluation Trials will be carried out in a couple of months. I always say that when we buy a car, we don’t just want it to go at 140 kmph. More importantly, we want it to be available to us everyday. Q. You’ve set ambitious timelines for the Tejas Mark II. Are they unrealistic? We are close to finalizing the engine contract with General Electric, the chosen vendor. By the first quarter of the next year, i.e. March 2014, the preliminary design would have been frozen. Somewhere in 2018, the Mark II will be ready for productionisation. This time there will be no prototypes. We will design for production. We have learned from the mistakes we made in the Tejas. Besides, there is no ambiguity in the Mark II, as there was in the Mark I. There are not likely to be any changes in the engine, radar, missile, communications. The equipment is known. The naval Tejas is a different challenge. We had incorrectly thought that deriving a naval variant from an air force variant would be easier. But, as we learnt, it is the other way round. We began with an undercarriage built for the air force Tejas. But landing on an aircraft carrier involves a much higher descent rate, which means the landing gear must be much stronger. When the aircraft catches the arrestor hook, the deceleration is enormous. When we did the load analysis, the whole bottom gear had to be re-engineered. I will not hesitate to say today that deriving a naval variant from an air force variant of the Tejas is a sub-optimal solution. But, having learnt this, the Mark II will be an optimal solution. We will not do any derivative from the air force version. It will be, ab initio, a naval design. Q. After the Tejas, ADA has been pushing hard for a programme to develop an Advanced Medium Combat Aircraft (AMCA)? Where is that? There is no approved programme yet, but the DRDO had approved a feasibility study which we have done. We are trying to arrive at the specifications of an engine that can give us supercruise (i.e. flying at supersonic without afterburner) but that kind of engine is not readily available. So we are deliberating on whether we should start designing an engine ab initio, or improve upon an existing engine. The IAF is very keen on the AMCA. Q. How long would this take to enter service? The AMCA would need 7-10 years for development, and so would enter production only in the mid-2020s. We would require time for building prototypes, stabilising the design, establishing a production line. We would gain expertise from the (Indo-Russian) Fifth Generation Fighter Aircraft (FGFA) programme. Q. Would we have both the AMCA and the FGFA? These are two different classes of aircraft and there is no clash between them. The FGFA is a 30 tonne class heavy fighter with a long range. The AMCA would be a 20 tonne medium fighter, with an extreme range of about 1000 km. Nor does it clash with the MMRCA. The Rafale is an early-1990s design. It does not fall into the 5th generation in terms of stealth characteristics. So the air force sees a place for the AMCA in its future fleet. 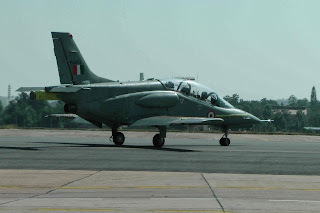 While the spotlight plays over the Tejas light combat aircraft (LCA) that will, on Friday, be certified fit for induction into the Indian Air Force (IAF), another India-built aircraft is at the cusp of readiness. Hindustan Aeronautics Limited (HAL) has revealed that its Sitara intermediate jet trainer (IJT), which has been in development since 1999, is now “just weeks away from certification”. Defence Minister AK Antony is flying down to Bengaluru to award the Tejas its initial operational certificate (IOC) on Friday. The Sitara’s success in intensive flight-testing this year means that he could soon be making another trip to award an identical certification to the Sitara. For the IAF, there could hardly be better news. The recent purchase of the PC-7 Mark II basic trainer from Swiss company, Pilatus; and HAL’s simultaneous project to develop the HTT-40 basic trainer, caters for training of rookie pilots --- termed Stage-1 training. The induction of the Hawk advanced jet trainer (AJT) in 2008 took care of Stage-3 training, after which pilots fly frontline IAF fighters. But Stage-2 intermediate training remains a gaping void that is inadequately filled by vintage Kiran Mark II trainers that date back to the 1970s. “We have accelerated flight testing dramatically this year, doing 183 sorties --- thrice as many as any preceding year. Last month we completed bombing trials and extra fuel tank trials in Jamnagar. Now we are completing the stall and spin tests, after which we will get the IOC,” says Krishna Kumar, Project Manager IJT for HAL. Business Standard visited the HAL division where the Sitara is undergoing flight-testing. One prototype was taxiing out for a test-flight, while technicians readied others. So keen is the IAF to get the Sitara into service that HAL has been allowed to press into flight-testing the 12 trainers the IAF ordered. In March 2010, the IAF also ordered 73 Sitara trainers for Rs 6,180 crore. These would be based at the IAF flying school coming up in Deesa, in Gujarat; and in Tambaram, where the IAF trains flying instructors. A tour of the Sitara makes it clear why the IAF is so keen. Unlike the clunky Kiran, the Sitara’s clean-cut lines are distinctly 21st century. While the Kiran seated both instructor and trainee side by side, the Sitara has tandem seating with the trainee pilot seated alone in front, where he gets the feel of flying solo even though he knows the instructor is seated behind. The Kiran’s quaint analog instruments are replaced with smart digital display screens, like those that equip modern fighters. From his rear seat, the instructor can control the trainee pilot’s instruments, simulating flight emergencies for the rookie to handle. “Everyone who sees the Sitara remarks upon its ‘wow’ factor. Many don’t believe that this is an entirely India-designed aircraft,” says Kumar. HAL was sanctioned Rs 180 crore in July 1999 to develop the aircraft and build two flying prototypes. In 2005, two years after the prototype first flew, the budget was raised to Rs 467 crore to order a more powerful engine from Russia and to build an all-glass cockpit. Eventually, development has cost Rs 634.23 crore. In addition, the IAF ordered 12 limited series production (LSP) Sitaras in 2006 for Rs 486.82 crore. That works out to Rs 40 crore per trainer, a fraction of what would be paid abroad for a similar aircraft that also integrates rockets, guns and bombs. The Sitara has faced its share of development setbacks. Around 2006, it was making good progress when it was decided to fit a new engine --- the AL-55I engine, specially developed in Russia for the Sitara, which HAL will manufacture in Koraput, Odisha. In 2011, flight-testing suffered a major setback when a Sitara crashed in stall testing, fortunately without loss of life. All that is history, say HAL project managers, as the Sitara is poised to enter service. It flies up to 700 kilometres per hour and up to 9,000 metres high. It can sustain gravitational forces from minus 2.5G to plus 7G (seven times the force of gravity). It has a range of 1000 kilometres, extendable to 1,500 kilometres with external drop tanks. The United States is rising steadily up the list of India’s top military suppliers. The ministry of defence (MoD) is finalising a decision to allow the FGM-148 Javelin missile, built by US companies Lockheed Martin and Raytheon, into in a contest to supply the Indian Army with anti-tank guided missiles (ATGM). This is bad news for Israeli company, Rafael Advanced Defence Systems, whose Spike ATGM was poised to be awarded the contract for 8400 missiles for India’s 350-odd infantry battalions, estimated to be worth Rs 9,300 crore ($1.5 billion). When India floated a tender, only Rafael had offered a missile that met the army’s requirements. But now the Javelin is on offer and an interested MoD wants it to compete with Spike. On Nov 11, the MoD’s apex Defence Acquisition Council (DAC) debated whether to buy the Spike. Eventually it shied away from a single-vendor purchase, even though a “global technology scan” that the military carried out earlier this year found no other comparable option. Now with the Javelin on offer, albeit as a latecomer, the game has changed. 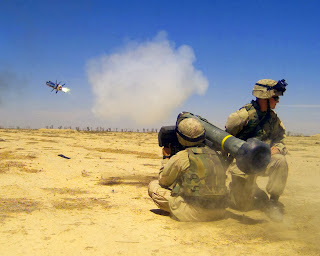 The US Department of Defense (the Pentagon) has offered the Javelin in two separate letters to the MoD this year. As Business Standard first reported (Sept 17, “US offers to co-develop new Javelin missile with India”) the Pentagon has sweetened its offer with a proposal to co-manufacture the Javelin in India, and to partner the Defence R&D Organisation (DRDO) in co-developing an advanced version of the missile for the future. The Pentagon has offered the Javelin under the US Foreign Military Sales (FMS) programme. This implies it would be contracted directly between the Pentagon and the MoD, with the Pentagon negotiating terms with Lockheed Martin and Raytheon, and charging India 3.8 per cent of the contract amount as a fee. The MoD, wary of procurement scams, believes FMS contracts are relatively clean and increasingly favours this route. The C-17 Globemaster III transport aircraft, bought for Rs 25,000 crore ($4.12 billion) was an FMS contract; the on-going purchase of M777 artillery guns is also through the FMS route. The Javelin offer also benefited from the personal advocacy of the recently retired US Defence Secretary, Ashton Carter, who lobbied forcefully during his visit to New Delhi on Sept 17. “(The Javelin) is being offered to no other country but India”, Carter told the media in New Delhi. India’s MoD has declined to comment on this proposal, but officials privately term the offer “unprecedented”. US equipment has always been bought over-the-counter. Now the offer to co-manufacture the third-generation (i.e. “fire-and-forget”) Javelin ATGM could bring in US best practices in high-tech manufacture. Meanwhile the DRDO is evaluating the proposal to co-develop a fourth-generation missile, an offer that the US has not made even to its closest allies. 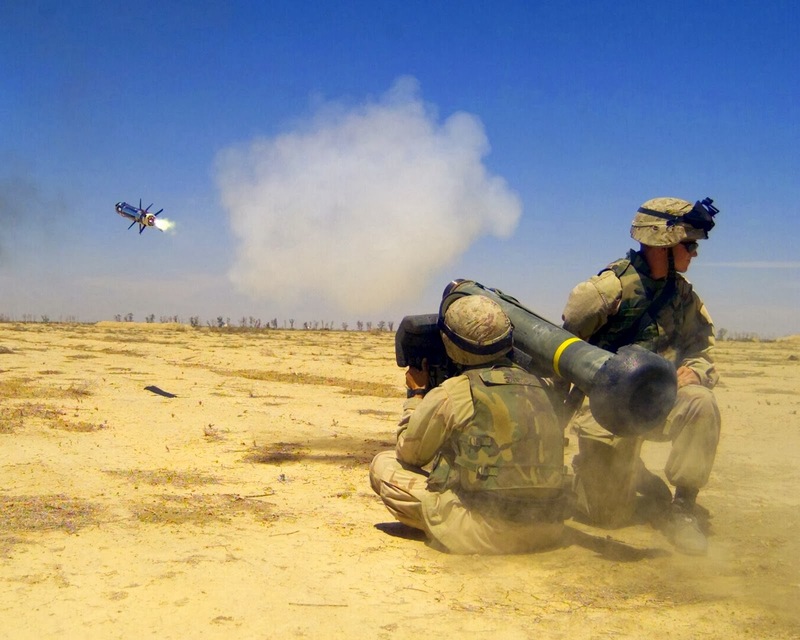 The Javelin, which has seen extensive combat in Iraq and Afghanistan, is regarded as the world’s premier man-portable, anti-tank missile. It allows infantrymen, who are often vulnerable to enemy tanks, a weapon to destroy tanks from 4 kilometres away. If the Javelin were superior to the Spike, as US officials claim, it would also be more expensive. The Pentagon’s co-manufacture and co-development offer seeks to compensate for that higher cost. Yet, the army is frustrated at the stalling of the Spike purchase, which was being finalised after extensive trials. The army has now asked the DRDO to co-develop an ATGM with an international partner. Since defence procurement rules require the DRDO to select a development partner through competitive bidding, Lockheed Martin and Raytheon might have to compete with Rafael, and possibly other global vendors as well. MoD sources welcome the prospect of US companies competing with other vendors to partner India in missile co-development. “The more vendors that compete, the better the deal for India”, says an official. Missile co-development with Israel has been plagued with glitches in the past. The Indo-Israeli Long Range Surface-to-Air Missile (LR-SAM) and Medium Range Surface to Air Missile (MR-SAM) projects are running years behind schedule. Meanwhile, Washington-based sources tell Business Standard that the Pentagon plans to make the Javelin offer even more attractive. Declining to provide details, they say the MoD will soon hear the specifics. Washington had not offered India the Javelin when the MoD first floated a global tender for ATGMs. The Pentagon was eager but the State Department argued that equipping India so lavishly would “alter the regional military balance”. With the US-India engagement maturing, the State Department is now fully on board. Indian Army missile pilots had fired the Javelin several times during US-India joint exercises and were impressed by its performance. Nevertheless, the Javelin would be comprehensively trial-evaluated, as the Spike has been. That will only begin when an FMS request is processed between Washington and New Delhi. With over Rs 50,000 crore ($8 billion) worth of orders already on its books, America is closing in on another Rs 30,000 crore ($5 billion) worth of arms sales to India. These include six C-130J Super Hercules tactical transport aircraft; 22 AH-64D Apache attack helicopters; 15 CH-47F Chinook heavy-lift helicopters; and 145 M-777 ultra-light howitzers. The Javelin could now swell that tally.